I’ve played my share of Final Fantasy games — I’ve played through the first, IV, VI, VII, IX, and X (with about six hours put into VIII before I decided my character was a d-bag and I didn’t wanna be him anymore) — but, like most American gamers, I didn’t play II, III, or V.
So, listening to a recent episode of Retronauts podcast, which did a deep-dive exploration of FFV, inspired me to finally check it out. I’m glad I did listen to that episode first, because I found out which version was the best one to experience — and that’s the fan translation of the Super Famicom original, as opposed to the only officially-released English versions for the PlayStation (which I own, but has an awful translation and long load times) and Game Boy Advance (which is good, but given the option I prefer the original version). Also, I’d always heard that FFV was all about this “job system,” which was a little daunting to me, and the Retronauts episode was a great primer for learning a little more about what to expect from the game. It does sound fascinating that FFV focuses more on the system than the story. So, after hearing the podcast — kinda like when your character has to talk to the King at the beginning of almost any average JRPG, and he tells you what you need to go do — I was ready to venture forth on a new quest. Thanks, Retronauts! One thing I was aware of was the translation of the main character’s name as “Butz.” I couldn’t handle that, so I changed it to “Bartz,” but because I’m a knucklehead and wasn’t paying attention, I used a capital Z instead of a lower-case, so now his name is “BartZ,” which LOOKS MORE EXTREME like something right out of the 1990s. 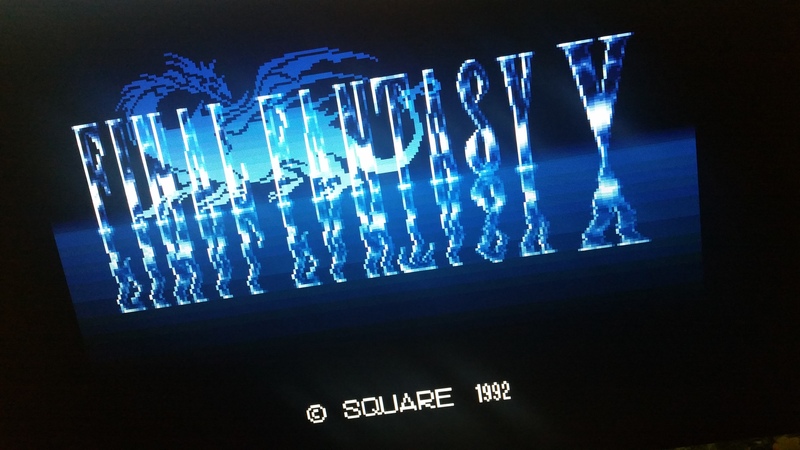 (Besides, FFV was supposed to be released in the US as “Final Fantasy Extreme,” which I remember reading about in gaming mags back then, so you know, it kinda works out). Also it strikes me funny. So I’m keeping it. So, away we go, I’m only an hour into it so I’m nowhere and I’ve done next to nothing and hopefully I’ll really love it. I’m playing it emulated, although as usual when I find something like this, I would love to add a repro cart to my collection. It would fit so nicely on my shelf betwixt my CIB copies of FFII(IV) and FFIII(VI). Further bulletins on FFV as events warrant. I’m also playing Kid Icarus: Uprising on the 3DS. I like it, but as happy as I am to have Kid Icarus back, I can’t say that this is quite the Kid Icarus game I’ve wanted for so many years. I would love something in the old style of the original game, but let’s face it — this is basically Sin and Punishment: Kid Icarus Edition. The graphics and music are nice, the game is very self-referential about being not only a videogame, but a sequel to an ’80s game, the constant banter between characters is amusing. On the downside, it hurts my giant man-hands to hold the 3DS in the way that’s necessary to use the optimal control setup for playing the game. (I have not attempted to use the little plastic stand that the game came with. This game would have worked so much nicer on the Wii.) So, since my hands get all crampy from playing it, I’ve been playing with the difficulty turned way down, just to cruise through it and see what it’s all about. There are a lot of levels and it’s getting repetetive. But I’ll finish it off, because Kid Icarus!